Official business made me travel to Belize City. Yeah, everyone tells me it’s more dangerous, but I have to see for myself. I discovered that I can use Google Maps on my phone. Type in the route while still connected through WiFi and off you go. Now I will only pass the same building twice before I realise I drive in circles ..haha..
My Facebook friends recommended Villa Boscardi. It’s really nice and clean! I have the green room 🙂 WiFi is great! The bed is massive! And the aircon … wonderful cool air! Of course, I can’t sit still for long. So I took a stroll down the road. Excuse the lousy quality. I only had my phone with me. You can still see the damage hurricane Earl made 2 weeks ago. Shopping in Belize City is great! In San Ignacio I only found these small shops to buy groceries. No way that you can buy what you need – you buy what you get! They even have shopping trolleys! .. and here I thought shopping in Belize would be a problem ..haha..
After the shopping spree I decided to take a drive around town before it gets too late. Okay, now Belize City definitely reminds me of South Africa! I have seen a lot in my days, but this sight made me stop and take out the camera. I uploaded the picture in it’s original size, so that you can zoom in. Have you ever seen a main road going through a cemetery ??? There are even graves in the green that divides the lanes !!! I think that’s enough for today. 2 nights in Belize City should be enough to tick that town off my list. The last few days I’ve been driving around in my pretty little car. I drove up to Spanish Lookout, Belize’s largest Mennonite community. Again, this is completely different to what I have seen in Belize so far. Wide open spaces – farmland. The Mennonite women are dressed traditionally in cotton frocks and head scarves. The men wear straw hats, white shirts, suspenders and dark pants. Occasionally you come across the horse-drawn buggies. Looking at the people you would never expect such a booming infrastructure in Spanish Lookout. The buildings are massive and modern. It is really beautiful up there. Unfortunately the day was very overcast, but I can imagine that the view must be breathtaking on a clear day. Crossing the Belize River – you can see the pillars of a bridge that never got built. Wood carvings offered on the side of the road. BTW, road signs are mostly non existent. That proofs to be a problem if you have no sense of direction – like me 🙂 Needless to say that after I passed the same building for the third time, I realised that I am driving around in circles. On my way back, I stopped in the twin town of San Ignacio – Saint Elena, to grab a coke. And of course, disaster strikes: The car does not start. Not a light or any sign of battery life. Luckily I had the number of my new best friend, Lisa, stored in my phone. Lisa immediately came to the rescue – with leads to jump start the car. Turned out that the connectors to the battery came loose while driving on the sand road. Once P.F. (short for Pathfinder) was rattling again, I followed Lisa to her new house. It is STUNNING! So stunning that I forgot to take a picture. But I am sure this wasn’t the last time I visited Lisa. She has 3 lovely boys – 2 of them are the same age as my youngest. They will have a great time playing together in the future! My 4th day in San Ignacio – When I walk through the streets, the shop owners greet me and ask what I am up to right now. 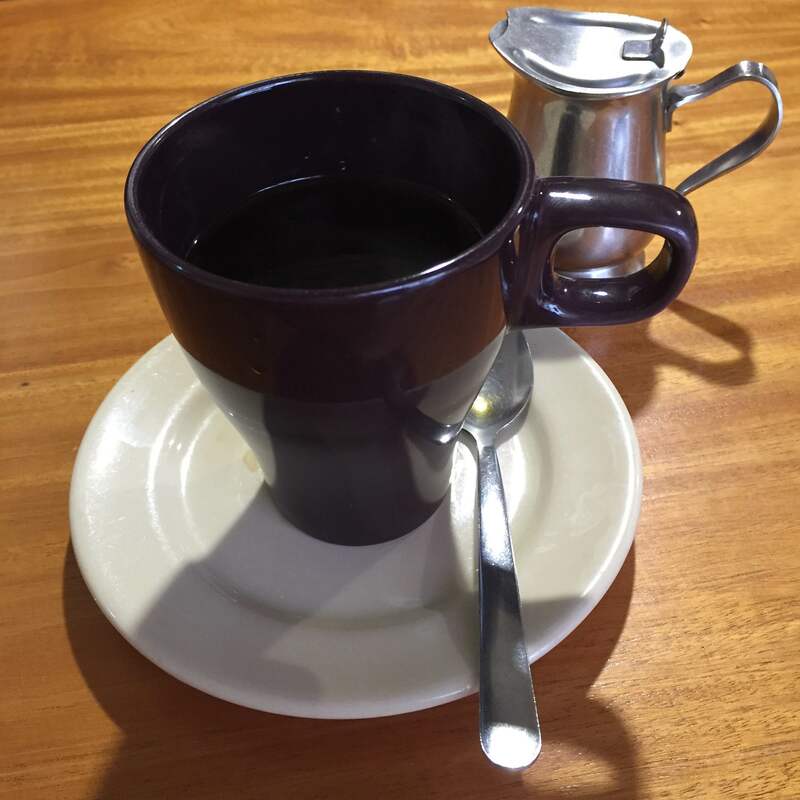 Everyday I try a new place to eat – except for breakfast! Pops is my favorite place for coffee and toast. And as of today I do not feel like a tourist any longer 🙂 I have a CAR !!! 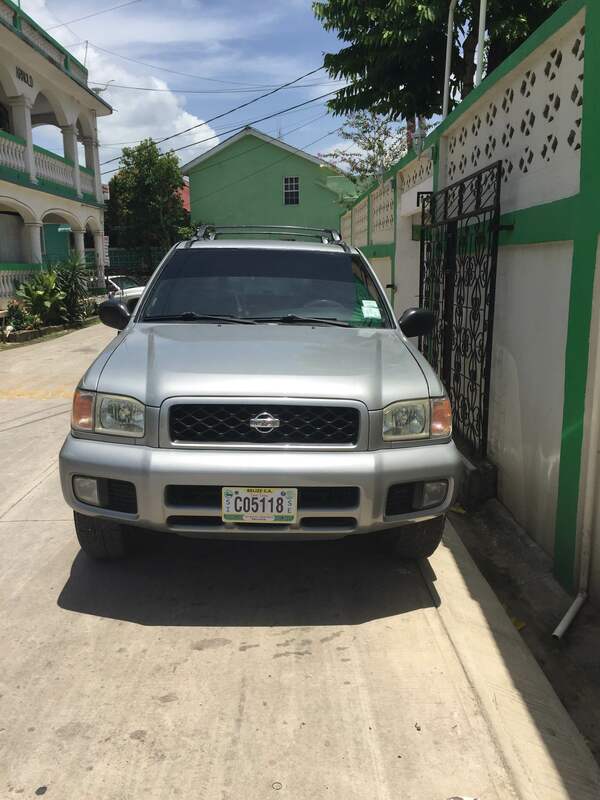 A Nissan Pathfinder – and I think I struck a bargain. “Clever me” then asked the old owner to come along while I fill up the car. Every country is different, and I hate it when I look dumb at the gas station. No self-service in Belize. You just stay comfortable in your car and everything is taken care of. I like that ! In Germany your hands stink like petrol after filling up. And now I am planning the next couple of days. Tomorrow I will be checking out San Ignacio’s twin town, Santa Elena, Bullet Tree and the Spanish Lookout. The following day I will head down to the coast: Belize City and then down to Placencia. I can’t wait to share the photos with you! After many months of planning I have finally arrived in Belize. My first stop is in San Ignacio – it’s a very central location from which I can explore the entire country. Coming from Germany you first need to get used to the building style. The houses are very colorful. Blue, green, red, orange, and yellow – just like a rainbow – and all of them could use a new coat of paint. The infrastructure reminds me a lot of South Africa. Electricity and phone wires are above ground on wooden poles. The ground floor of every house holds some kind of a business – a small convenient store, a restaurant, a bar, clothing, furniture or appliances. The owners sit in front of their shops. I arrived rather late in the day and was tired and hungry. The 8 hour time difference didn’t help much either. Right after unpacking my luggage, I collapsed into bed at 6pm. Doubts were creeping in: Did I make a mistake? Is this really where I want to live with my family? The kids insist that I check out the beaches, before deciding on our next home. I gave myself 4 weeks to learn as much as possible about the country. If it was just me and my husband, the choice would be easy. Bringing 3 kids and grandma along does make it a bit more difficult. The schools are very important. As a parent you have a responsibility towards the kids and I intend to structure our lives around their education. They are only part of your life for a short time, before leaving the nest.